At C&D Logistics® we have years of experience in freight shipping throughout North America. Our experience comes from not just one person, but an entire team that is knowledgeable. Each individual brings a unique set of skills to C&D. Together this creates a company that is able to provide quality service, faster, and on budget. We want to highlight one of our employees that helps us accomplish this: Kimberly Handley. Kimberly has worked at C&D Logistics® for 5 years. She previously worked for Fraser Health in office administration. Experience in the medical field has allowed Kimberly to work in a fast paced environment where results are critical. These skills she has brought over to C&D. 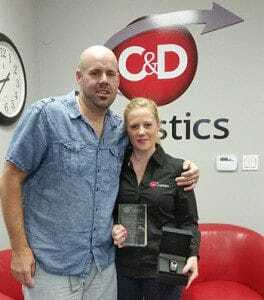 As part of her role at C&D Logistics®, Kimberly provides customer service, handles private insurance, billing issues, and credit applications. It is thanks to Kimberly that we can provide quick answers for all of our clients. It is important to ensure that everyone involved in the shipping process is covered properly and that nothing is held up at billing. These are the things that can delay a shipment and cause an annoyance to everyone involved. Kimberly’s knowledge and experience has allowed her to handle these situations and serve our customers exceptionally. Kimberly loves the outdoors and spends her time camping and 4×4 quading with her family. She also dedicates her spare time to Kimz Angles, an organization that works to reduce poverty for families and children in the community. We are proud to have a community conscious individual that gives back to those who need it most. “As someone who has been part of this company for over 5 years I can honestly say I couldn’t image doing anything else. I have had amazing opportunities passed along during my time here”. We are proud to have employees like Kimberly who help our company to provide the best service possible. C&D Logistics® understands the importance of time and cost to all our clients. Through our 30-30 Service Standard we get back to all our customers within 30 minutes on a business day. For more information on C&D Logistics® or to start shipping with us fill out a shipping request or call us at 604-881-4440.